It just so happened that the February 2009 issue of "Quilter's World" featured a pattern they call "Kyoto" which ... oh gosh! 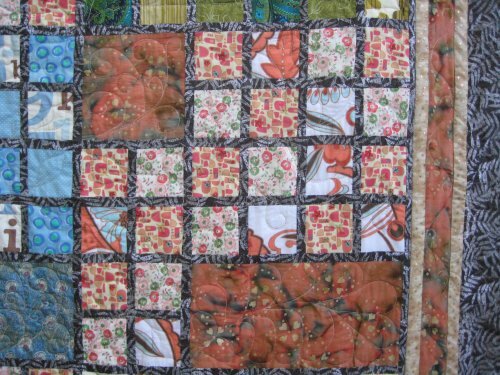 .. uses 3-1/2" squares, exactly what the client quilt used! This pattern is made of 6 *big* color-block areas sewn together in a window-pane looking layout. And I totally, thoroughly loved it. Even though I need another magazine ... and pattern ... and project .. like another hole in the head, I bought the magazine and .. hold onto your hats ... completed the top only (no quilting) from the leftover squares from my client's quilt, while I was at a break point during the client's quilt. While all the small squares are leftovers from the client quilt, the larger focus fabrics, inner borders & border corners came from my stash. I did buy some soft black pattern fabric for the sashing and outer border, as I didn't have anything on hand that worked well. After the top was finished, it sat around for about 7 months before it got quilted. Life got in the way, events happened, I was not motivated ... just a whole lot of excuses reasons why I didn't quilt it at that time. One of the main reasons is that deciding on a quilting design is a LOT of work! I'm not terribly artistically inclined and so I tend to have mental roadblocks about what kind of motif should go where. 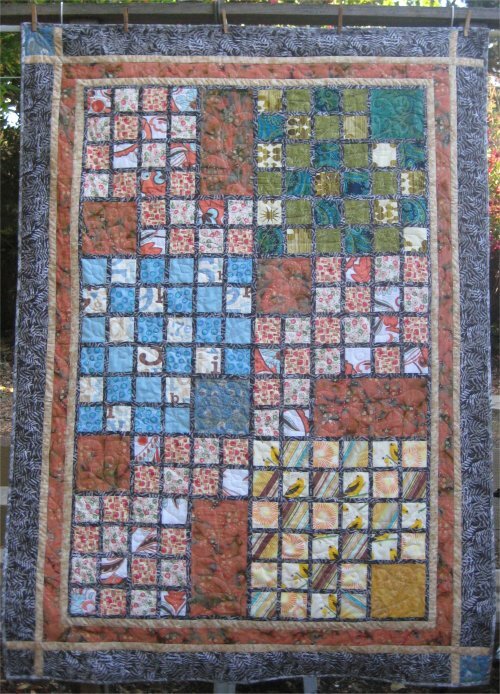 I pull out a lot of reference books; I look at quilting websites; I Google for quilt images for ideas and inspiration. The technique I used to come up with that plan was something that I read elsewhere ... print a page-size picture of your quilt. Cover it with clear acetate (I used a report folder) and doodle on it with a dry erase marker. The dry erase marker wipes off easily with a Kleenex (or cotton ball or fabric, etc). This makes it exceedingly easy to erase designs that don't work out. I kept this design plan beside me when I was working on Lizzie to help keep on on track. I didn't follow it line-for-line, but rather as a guideline for what I wanted it to look like. 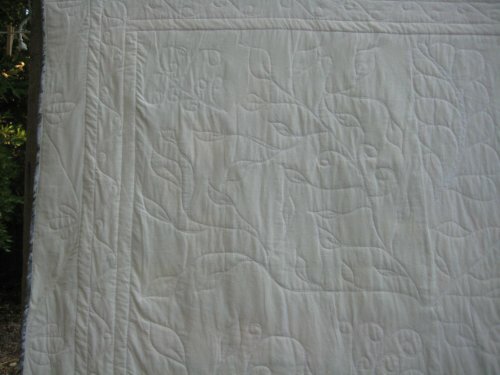 I also chose to do the quilting in a Superior Thread beige tone-on-tone, so as to blend with the quilt. The quilting on the outer border virtually disappeared due to the color of the thread and the pattern of the fabric. The same thread on the next (inner) border shows up because the batik reads as a solid. 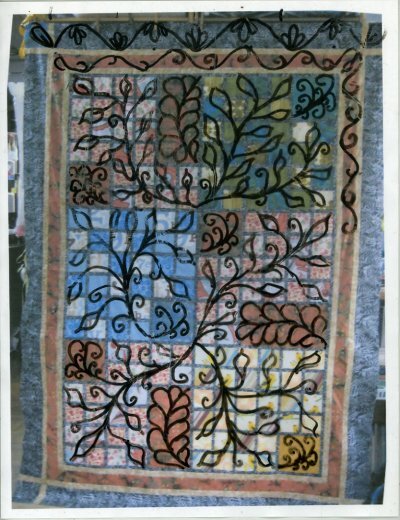 Below is a sequence showing the quilted borders, same photo with the quilting drawn on and then a view of the borders from the back. The color block areas are so busy, anything I did there wouldn't be too noticeable. For example, take a look at this color block area to the right. While you CAN see the quilting in the single fabric areas, you can NOT see the quilting in the color-block area. Compare what the quilting is to the doodling plan (link above). Eventhough the quilting doesn't show up in the color block areas, I'm happy with the way it turned out. I got to practice new motifs. I've learned that I need to practice, practice, practice to get the feathers looking feathery, instead of like sausages. :-) (I didn't show you the first feather design done on this quilt. It came out .. umm ... "not very feathery". But, I didn't dislike THAT much to rip it out and re-do it; on the other hand, I don't like so much as to actually SHOW it to you!). The magazine also offers a website extra .. a pillow made from one of the color-block segments. I promptly downloaded this website extra, since I knew that if I didn't do it at that time, I would complete forget about it. Furthermore, I even MADE the pillow out of completely different fabrics ... you'll read about it in the next gallery entry!